A tan is nothing but development of golden brown shade over one's skin. It is a process which is carried on by our bodies to protect us from sun. When our body is exposed to sun, it causes tanning. While over-exposure to sun can cause severe tanning which may damage the skin, sometimes tanning is good too. Tanning helps in absorption and synthesis of Vitamin D in our body which is vital for strong bones and teeth. In western countries, people take sun baths to have a nice tan on the body. Tanning is caused by the exposure to sun rays. Sun rays can damage the skin, the hormone Melanin present in our bodies reacts with sun radiations to protect the skin from severe damage. 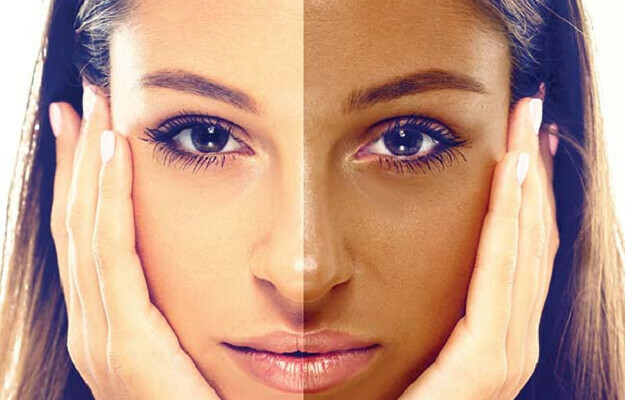 The melanin on reaction with sunrays become darker than normal which causes the skin to look golden or brown. When UVA and UVB rays reach our skin, they penetrate our skin causing sunburns. These rays are very harmful, they can cause skin cancers, premature aging, severe burns and extra production of melanin which makes us darker. Sunburns can cause inflammation of skin, reddening and scaling. This can be painful and it can take time to heal. Ozone layer protects the Earth from the harmful rays of sun by creating a shield over Earth. However, the Ozone is depleting due to the increasing use of CFCs. It is now important to take precautions at individual level. Applying Sunscreen with SPF 30 and above, covering hair and face with a scarf, carrying an umbrella, can protect you from sun. Wearing full sleeves and avoiding direct exposure to Sun will also help. Home remedies like lemon and sugar scrub, cucumber juice and gel, potato juice, baking powder with apple cider vinegar, curd can help in removing tan. Applying Aloe vera gel will not only remove tan but will also help in treating sunburns. Buying suntan lotions and sunblocks from brands like Lakme, Lotus, Himalaya, Neutrogena etc can help in further protection from tanning.